The Western Rosslyn Area Planning Study (WRAPS) was a County-led community planning process, completed in 2015, that created a vision and Area Plan for the Wilson School and surrounding sites which include Fire Station 10, a park, an office building, retail and affordable, multi-family apartments. The Arlington County Board adopted the Area Plan on July 21, 2015. Read the news release. Arlington County staff, Arlington Public Schools, property owners and community members are collaborating to implement the vision outlined in the Area Plan. On Feb. 25, the County Board approved several use permits and site plans in a coordinated effort to enact the vision adopted by the Board in 2015. Initiated in 2014, the County recognized the study area was an essential site for Arlington and worked with the community and property owners to achieve a comprehensive solution. The County Board appointed a Working Group of Arlington residents, business leaders, property owners and advocates, to work with the County's planning staff. A key driver of the process was achieving the greatest amount of contiguous and usable open space. The School Board's decision to locate a new school on the Wilson site significantly reduced the County's ability for a major increase in open space while meeting site goals. The Area Plan process completed in 2015. A history of all Area Plan documents are available online. 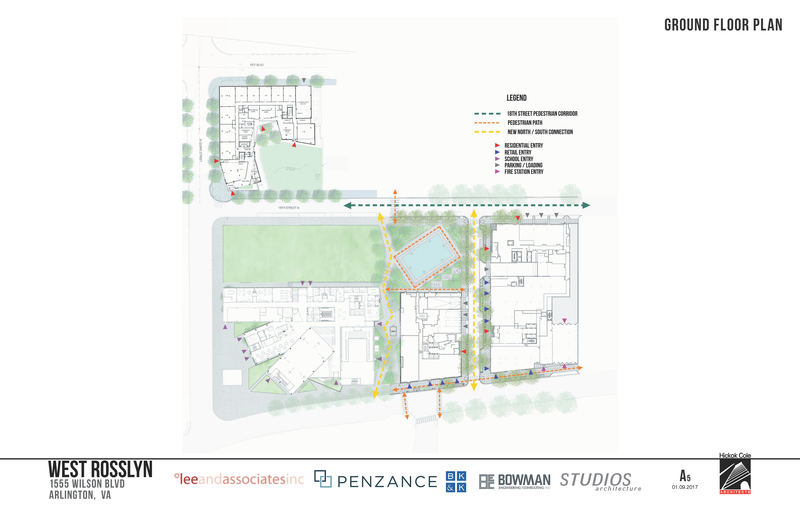 The site is generally bordered by 18th Street North to the north, Wilson Boulevard to the south, North Quinn Street to the west and the eastern property line of the 1555 Wilson Boulevard office building site to the east.